Vad är skillnaden på Dometic S4/5/6 fönster som KABE, Polar och Cabby mfl använder jämfört med enklare versioner som sitter på andra tillverkare som tex Hobby. I don’t know about you, but I’ve never been a fan of the traditional aluminum and glass slider window found in today’s recreational vehicle. It often sticks, making it difficult to open, is hard to disassemble and clean, and provides ventilation for only half the window. Not only that, but the traditional RV window is downright ugly and requires some kind of mini-blind, pull shade, or curtain be used with it if you want any kind of privacy. My intense dislike for this window was one reason I decided to buy a Northstar truck camper with the Dometic Seitz thermal pane window. The purpose of this article is to discuss the pros and cons of the Dometic Seitz thermal pane window and to share a few tips on how to use and properly care for it. First, a little history. Swedish based Bonocar was the first company to produce this unique window. Bonocar was bought out by Seitz, a German company, and Seitz produced it for several years before Dometic bought out Seitz in May 2000. The window has grown increasingly popular over the years and is now used in most motorhomes and caravans in Europe, Australia, and New Zealand. In 1987, Northstar Campers was the first company in the United States to import this window and offer it as an option in their truck campers. Other truck camper manufacturers that now offer Dometic Seitz window as an option include Northern Lite, Outfitter, S&S, XP Campers, and Lance. High-end expedition RV manufacturers in the U.S. that use the Dometic thermal pane window include Earthroamer, Sprinter, and Global Expedition Vehicles. The most common offering in the United States is Dometic’s so-called S4 hinged model. Sold in various sizes, it has a hinge on top that allows the dual-pane window to be pushed open like an awning. Within the window’s frame is a built-in roller screen on top and a privacy roller shade on the bottom. Other styles and models of acrylic thermal pane windows are sold by Dometic as well including sliding models and hinged models without built-in roller screens and shades. If you’re interested in installing these windows in your homemade camper or RV, you’ll have to order them from a European RV parts supplier (the United Kingdom’s eBay is a quick and easy way to access some of these suppliers). Depending on the size of the window, you’ll pay anywhere between $300 and $500, not including shipping. So what are the pros of the Dometic Seitz thermal pane window? First and foremost, the window has dual acrylic panes with the void in between filled with an insulating argon gas. This gas keeps the heat and cold out of your RV far better than traditional RV windows. Not only do Dometic’s window’s insulate better, but they also resist annoying condensation during freezing temperatures. The Dometic thermal pane window is also easy to open–simply disengage the inside latches and push the window out into one of the two preset open positions. When open, the window provides a terrific amount of ventilation–the full size of the window not half like the traditional RV window. Better yet, when you’re away from your camper, you can keep the Dometic window open in the rain to keep your camper ventilated. Again, you can’t do that with the traditional RV window. The Dometic Seitz thermal pane window has additional pros as well. It features an easy to operate, built-in roller screen on the top and a built-in roller shade on the bottom. The bug screen and privacy shade can either be clipped together, if you like, or can be operated independently. This means you can enjoy a total blackout with the shade pulled up or enjoy an unencumbered view without having to look through a bug screen. Not only that, but the privacy screen on the exterior side has a reflective surface that resists both sunlight and heat, a much appreciated feature, especially for those who live the desert. On the outside, the tinted, black-framed window just plain looks better, too. In fact, there isn’t a cooler, better looking window in the RV industry. 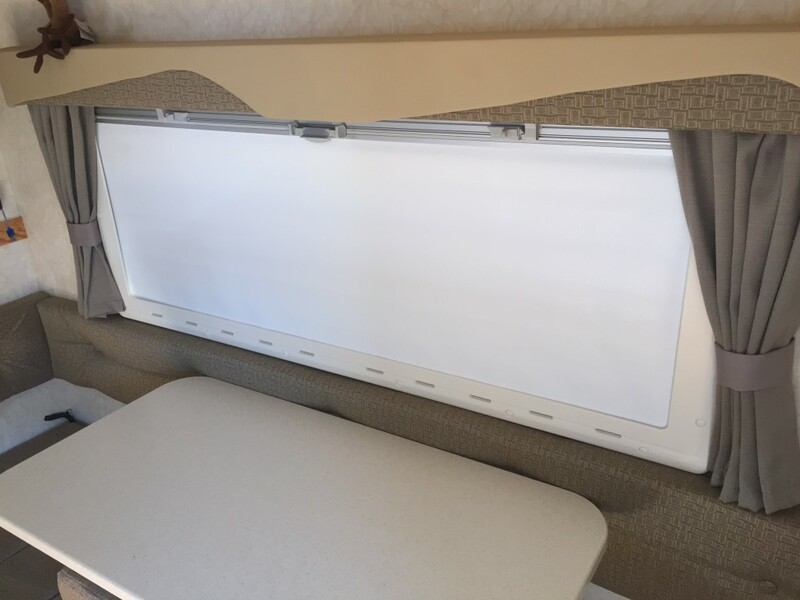 Finally, the Dometic Seitz thermal pane window weighs less than the traditional glass window which is why many manufacturers, like Lance, are now installing them in their truck campers. So what are the cons? Well, the biggest is that the window panes are made of plastic acrylic and can easily be scratched. In spite of our best efforts to keep shrubs and branches away from our rig when we’re exploring, we invariably catch a branch or two that scratches the windows (fortunately, these can be buffed out, see the maintenance and care tips below). Another negative is that you have to roll up the bug screen to close the window. Under the right conditions, this can allow bugs to enter your camper. Not a big deal for those of us who camp in areas where bugs aren’t a problem, but this can be a huge negative for those who live and camp in areas where flies and mosquitoes are particularly bad. Furthermore, the screens and shades can come out of the side tracks if you accidentally lean or push on them hard enough on the inside. This is especially easy to do with a window located along a dinette, though the screen is fairly easy to get back in the track if this happens. 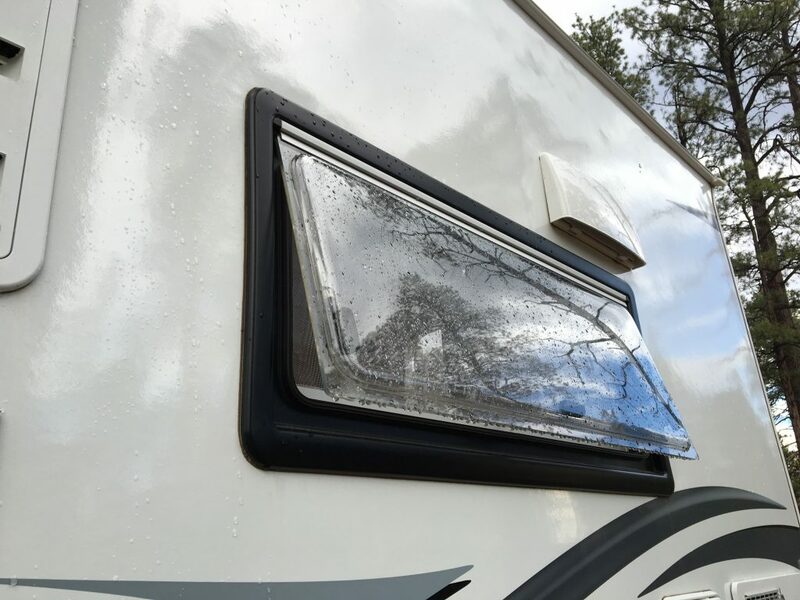 When it comes to the care of the Dometic Seitz thermal pane window, Rex Willet, the owner of Northstar Campers, offers some valuable tips. Rex recommends that the acrylic window be waxed with a polymer wax once a year to protect it from the elements. He also suggests that a 303 protectant be applied to the frame in order to protect and maintain its finish and on to the seals to keep them supple. Rex also recommends that a silicone lubricant spray be applied to the inside corners of the screen and shade rollers once a year to keep them lubricated and free moving. The struts that lift and hold the window open should be lubricated twice a year with this same spray lubricant. He warns to never drive with the windows open, and always push the button before each latch is opened or closed to prevent damage to the mechanism. Here are some more tips. Use microfiber cloths when cleaning the window, they’re non-abrasive and work well in removing dirt and residue from the surface of the window. When cleaning the window, Rex cautions that an up and down or side-to-side motion be used, never a circle as it can create a swirl look in the acrylic if the rag happens to be dirty. Fortunately, a scratched window can be buffed out with polishes made specifically for plastic acrylic windows. I use Meguiar’s M17 Plastic Cleaner and Meguiar’s M10 Plastic Polish. These work perfectly on Dometic’s acrylic windows, are easy to find here in the U.S., and cost less than $6 a bottle. Dometic sells a cleaning and polishing kit as well, but it’s pretty expensive since it has to be shipped from Europe. Hopefully, you found this article both informative and useful. As you can see, the pros of the Dometic Seitz thermal pane window far outweigh the cons, but I realize that it still isn’t for everybody. Nevertheless, it’s still a great option for those who are looking for a light-weight and versatile window that can be used in all kinds of weather and climates. It’s true that it’s expensive, but you get what you pay for. When you buy a Dometic thermal pane window, you’re buying probably the best window in the RV industry. As long as it’s properly maintained, it will last and perform for many years. Är Svenska KABE Klubben en klubb?